"They were warned...They are doomed...And on Friday the 13th, nothing will save them." "Friday the 13th" is the first installment of the long-running "Friday the 13th" horror franchise. A group of young adults travel to a remote forest campground called Camp Crystal Lake. Their job is to reopen the summer camp, which has been shuttered for years after a young boy named Jason drowned in the lake. Their hard work is disrupted by a mysterious killer, who murders the counselors one by one and hides their bodies. Finally, the killer confronts a young camp counselor named Alice, the final survivor of the rampage. A game of cat and mouse ensues. Just when Alice appears to have finally made it out alive, she receives one final horrific shock. The "Friday the 13th" series is known for its killer, hockey-masked psychopath Jason Voorhees. However, in the original film, it is Jason's mother, Pamela, who turns out to be the killer. In 1958, her son Jason drowned because the camp counselors weren't paying attention to him. 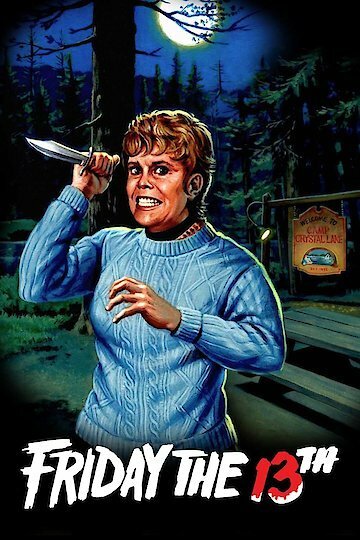 Insane with grief and rage, Pamela decides she must take extreme measures to keep the campground from reopening. "Friday the 13th" features Kevin Bacon in one of his first film roles. He plays a character named Jack, who is the All-American boy of the group. It also features Harry Crosby, the son of famous singer Bing Crosby. Pamela Voorhees is played by Betsy Palmer, a prolific television actress. The rest of the roles are filled by unknowns. The film was inspired by the success of "Halloween" in 1978. Both "Halloween" and "Friday the 13th" are among the first slasher movies, a subgenre of horror typically involving a masked killer stalking and murdering high school or college students one by one. The films typically end with the final survivor, who is almost always a girl, confronting and defeating the killer. The genre was extremely popular in the 1980's. "Friday the 13th" spawned a very successful franchise. To date, there have been eleven sequels and a 2009 remake. The series' success has made the original "Friday the 13th" one of the most historically significant horror flicks of the past thirty-five years. Any horror fan who hasn't seen it should take the time to view the original movie and find out how it all began. Friday the 13th is currently available to watch and stream, download, buy on demand at Showtime, Amazon Prime, Amazon, Vudu, Google Play, FandangoNow, iTunes, YouTube VOD online.